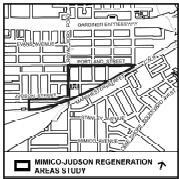 The Mimico-Judson Regeneration Areas study is about a revitalization framework to accommodate employment and residential population growth which capitalizes on the lands’ proximity to Mimico GO Station. The study addresses Land Use, Movement, Urban Design, and Community Services and Facilities. The Final Report from the consultant team led by Urban Strategies can be provided by city staff. Please contact the planner for any consultation materials. In addition to the components of the Planning Study, the City retained consultants to undertake additional analysis related to noise and vibration as well as economic trends and opportunities in the Study Area. These pieces of work, along with the Planning Study, informed City staff in the preparation of a Secondary Plan for the Mimico-Judson area. The planning and transportation consultant team developed a Demonstration Plan which illustrates conceptually how the Study Area could be built out based on the study research and findings conducted to this point including a precedent review, consultation with the community working group and stakeholders as well as professional planning analysis of best practices. The Study Area is bisected by Royal York Road. To the east of Royal York Road, the Study Area is bounded by Portland Street to the North and the Metrolinx Rail Corridor to the south. To the west of Royal York Road, the Study Area is bounded by Judson Street to the North, Willowbrook Road to the West and the Metrolinx Rail Yard and Facilities to the south.